With many of us leading increasingly busy lives with much less time to spend in the kitchen than previous generations, finding faster ways to feed your family healthy and nutritious meals has never been more difficult. But have you ever thought about using your microwave to cook healthy food quickly? Try as we might, all too often the modern pace of life means eating well takes second place to convenience, and with more ready meals flooding the market these days, there’s never been a better time to reinvent the microwave meal to meet the demands of 21st century living. Forget high fat, high salt ready meals, our range of microwave accessories will change the way you use your microwave for good, making it easier than ever to enjoy nutritious, home-made meals that are big on flavour and take less than 20 minutes to make. It’s so simple – no faff, no fuss… just a fresh way to really turn up the wow factor and make a lot more of your microwave. So what are you waiting for? We’ve been microwave pioneers from the start! Microwaves first came on the scene in the USA over 50 years ago, becoming commonplace in kitchens across the UK in the 1980s when more affordable countertop models offered a revolutionary way to cook. 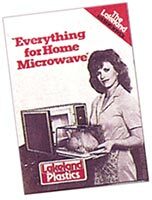 Here at Lakeland, we were pioneers of microwave cooking from the start, developing one of the first ranges of microwave-safe cookware to make this ‘new’ way of cooking more accessible. And though we’ve seen many cooking trends come and go, we’ve always believed there’s so much more you can do in your microwave than just reheat beans – it’s not just what you put into your microwave, it’s how you use it that really makes the difference. JENNIPHER MARSHALL-JENKINSON is Britain’s leading authority on microwave cooking. She has written several books on the subject and is also Chair of the Microwave Technologies Association. She’s very kindly provided us with some surprising hints and tips. Put oranges and lemons in the microwave oven and heat on HIGH for 15 seconds – this makes the fruit easier to squeeze and also helps yield more juice. Fruit like avocado pears, ordinary pears and mangoes can be ripened quickly. Set in the middle of the microwave oven and heat on MEDIUM for 30 seconds. Leave to cool, but use the same day otherwise they will over-ripen. If you have leftover coffee made with ground beans, keep it in the refrigerator – microwave 1 cupful at a time for 11/2 minutes. Result – fresh tasting coffee – instantly! Tomatoes and peppers can be peeled easily if they are set on a glass oven-proof plate then heated in the microwave on HIGH power for 1 minute. Toasted desiccated coconut, chopped or sliced nuts and seeds (eg. Sesame) not only add extra colour but are great for all sorts of toppings. Spread coconut, nuts or seeds on to a glass oven-proof plate. Heat on HIGH for 2-3 minutes until they start to brown. Stir frequently during cooking so that they do not burn. Leave to cool before using. If all you use your microwave for is defrosting meat and warming beans, you’re not alone. It’s time, however, to unleash the power of your microwave’s true culinary potential with Lékué’s easy to use silicone range. You might be surprised at just what your microwave can do with these clever silicone containers to help – from tarte tatin to a whole succulent chicken in just 20 minutes, you can cook your way to a healthier lifestyle. Offering a faster, more convenient way to cook your food that traditional pots and pans, microwave cooking retains nutrients and flavour, so not only will your food be ready quicker, as it’s cooked in its own juices it will taste much better too. Do you love the sweet, buttery crunch of corn on the cob, but find them fussy to eat, burning your fingers and slipping out of your hands just as you’re about to take the first longed-for bite? Lékue’s sweetcorn cooker allows you to prepare two corn on the cobs with ease in only 6 minutes. 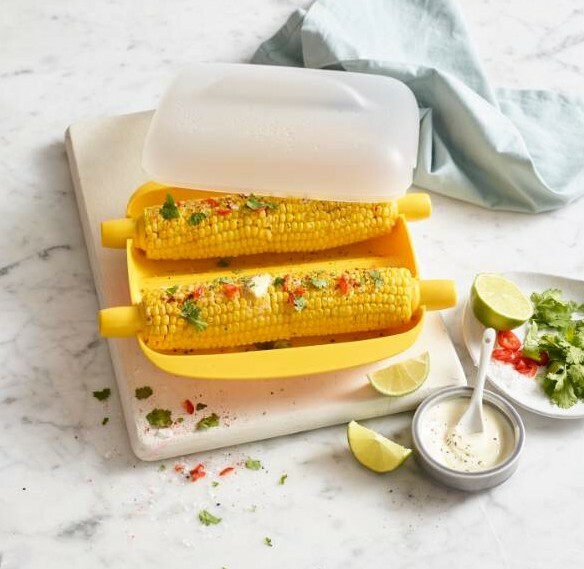 Simply screw the heat-resistant holders into each end of your cobs and slot them into place in the container before attaching the lid; as the holders sit outside the dish, they keep cool, protecting your fingers and allowing you to fully enjoy sweetcorn perfection without any fuss or mess. There’s nothing worse than putting time and effort into baking the perfect tarte, only for it to fall apart while trying to get it out of the dish, but with Lékué’s cleverly designed silicone and ceramic set you can make a fuss-free and delicious Tarte Tatin with ease. After baking your tarte in the silicone mould, insert the ceramic plate into the lip around the edge of the mould to keep your tarte secure as you flip it over, finally removing the mould to reveal your beautiful bake. Have a go yourself by checking out our scrumptious microwave harvest vegetable tarte tatin on the Lakeland blog. Enjoy experimenting with a variety of delicious melt-in-the-mouth toasties and paninis with Lékué’s delightfully versatile grill. After preheating the grill in the microwave for just 3 minutes, pop in your sandwich, and only 3 minutes later you can devour your toasted treat. 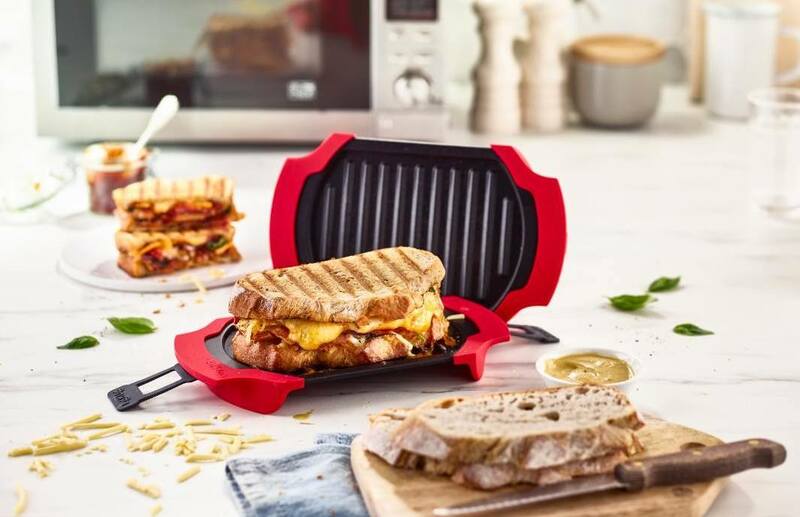 The metal plates ensure your toastie is nice and crispy, with authentic griddle lines, while the stretching silicone loops at each end allow you to stuff your sandwich with a myriad of mouth-watering ingredients. Not just for toasties, you can also perfectly ‘grill’ chicken, burgers, vegetables and much more. Perfectly cook and serve fluffy rice in minutes with Lékué’s Microwave Rice Cooker. 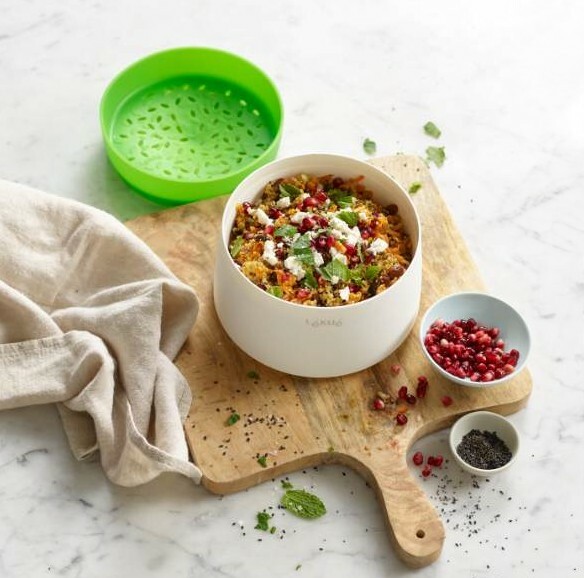 Making up to four servings in 12 minutes, it has a specially designed silicone lid to prevent things bubbling over into your microwave, and the attractive double-walled bowl will help keep your rice warm for longer at the dinner table. Ideal for couscous, quinoa and other grains too, it saves time because there’s no need to boil water before you start to cook. Ideal for rice, pasta, stews, soups, meat, fish and vegetables, they’re so easy to use. Cook an entire roast chicken in the deep one, or like our buyer Veronica who swears by her go-to recipe for good food fast, use the shallow one to whip up delicious salmon with veggie noodles in minutes. In just 12 minutes you can be tucking into a delectable Spanish omelette or frittata – perfect for a quick and easy midweek supper – with the help of this easy-to-use, double-sided microwave marvel. Use it to cook your fillings first before adding your eggs to finish off with no tricky flipping required, and the hinged silicone mould will turn out a perfectly round finished result. 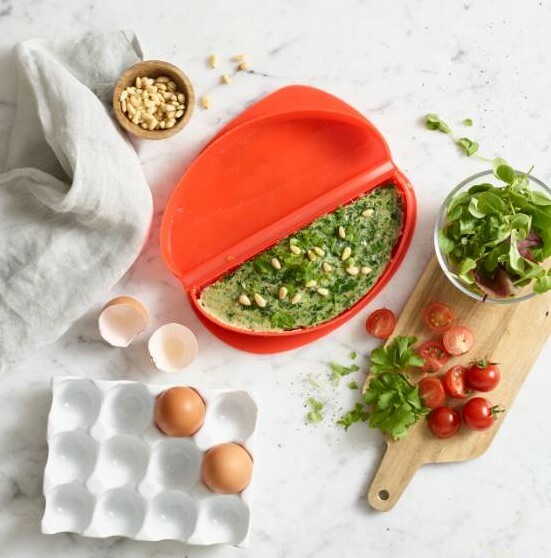 There’s nothing quicker than eggs for a healthy lunch or speedy supper, and it takes just 2 or 3 minutes to make a yummy filled omelette in this silicone wonder. You can cook fillings in it first before adding your eggs, and its double-sided design ensures both sides are cooked for a fluffy feast that pops out with ease – no flipping required! Want to get more from your microwave? Let Lakeland give you a helping hand! Take a look at our full range of microwave cookware and our tempting microwave recipes.